Freddie Mac (OTC: FMCC) released the results of its first quarter refinance analysis showing homeowners who refinance continue to strengthen their fiscal house. In the first quarter of 2012, 79 percent of homeowners who refinanced their first-lien home mortgage either maintained about the same loan amount or lowered their principal balance by paying-in additional money at the closing table. Of these borrowers, 58 percent maintained about the same loan amount, and 21 percent of refinancing homeowners reduced their principal balance; the share of borrowers that kept about the same loan amount was the highest in the 26-year history of the analysis. “Cash-out” borrowers, those that increased their loan balance by at least five percent, represented 21 percent of all refinance loans; the weighted average cash-out share during the 1985 to 2008 period was 50 percent. The median interest rate reduction for a 30-year fixed-rate mortgage was about 1.5 percentage points, or a savings of about 27 percent in interest rate, the largest percent reduction recorded in the 27 years of analysis. Over the first year of the refinance loan life, the median borrower will save about $2,900 in interest payments on a $200,000 loan. The net dollars of home equity converted to cash as part of a refinance, adjusted for inflation, was at the lowest level in nearly 17 years (since the third quarter of 1995). 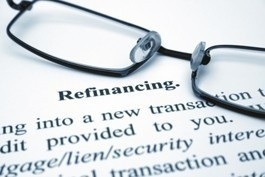 In the first quarter, an estimated $5.3 billion in net home equity was cashed out during the refinance of conventional prime-credit home mortgages, down from $7.0 billion in the fourth quarter and substantially less than during the peak cash-out refinance volume of $83.7 billion during the second quarter of 2006. Among the refinanced loans in Freddie Mac’s analysis, the median prior loan life was 4.3 years. One-half of the loans that were paid-off had been in place from between three and seven years, that is, had been originated between 2005 and 2009. “The typical borrower who refinanced reduced their interest rate by about 1.5 percentage points,” says Frank Nothaft, Freddie Mac vice president and chief economist. “On a $200,000 loan, that translates into saving about $2,900 in interest during the next 12 months. Fixed-rate mortgage rates hit new lows during March, with 30-year product averaging 3.95 percent and 15-year averaging 3.20 percent that month, according to our Primary Mortgage Market Survey®.